The Memory Craft 6500P is not your usual home sewing machine. It is a computerized dream machine for every type of sewist – from garments to quilting and home dec. 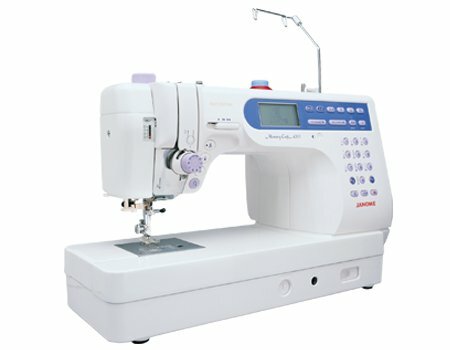 It provides the speed and precision critical to advanced sewing and contains serious features for the serious sewist. Sewing speeds of 1,000 stitches per minute mean that your projects get finished quickly, and our advanced features ensure that they get completed easily. It also includes many features designed especially for the quilter, including specialty stitches and an advanced feed mechanism. Automatic Thread Cutter: A Quick Key directly above the needle engages the Automatic Thread Cutter and accurately snips your thread. You can also program the machine to clip your thread at the end of a custom stitch sequence. Knee Lift: It lifts the presser foot while leaving the needle in place so you can keep your hands on your work. A favorite feature of quilters, it’s also very useful for garment and home dec projects. 9” x 5” of Bed Space: 9” x 5” (225mm x 120mm) is the largest arm and bed space of any household sewing machine. And, it comes standard with a generous extension table for even more room. Customize Stitches: Stitches can be elongated, flipped and combined with other stitches, then saved into the Memory Recall Bank. Adjust stitch width from 0 to 7mm. Adjust length from 0 to 5mm. Easy Needle Threader: Another great time saving feature to get you sewing faster. Just push down the lever, loop the thread through, release, and you’re ready to sew. Shortcut Buttons: Automatic needle threader, Needle Up/Down, Lock Stitch and Reverse Keys are all within easy reach right above the sewing area. Independent Bobbin Winder: When you need to wind another bobbin, you don’t have to stop and unthread the machine. The MC6500P has an Independent Bobbin Winding Motor, so you can wind your bobbin while you keep sewing.